For high quality fineness crushing as tertiary crushing or quaternary crushing before grinding. This series of Hammer crusher are widely used in metallurgy, mine, chemical, cement, coal dry stone, construction, sand making, refractory materials and ceramic industries. Used for tertiary or quaternarycrushing, it mainly suitable for crushing various ores the compressive strength of which is no more than 320MPa. (1) High productive capacity and big crushing ratio. (2) Low power consumption and evenly granularity product. (3) Simple, well knit and handy mechanical structure. (4) Low investment costs and convenient management. Hammer crusher is composed mainly by the frame, rotor, impact iron bar, grid bar and other components. The frame consists of upper and lower parts, which are welded together after cutting by a steel plate, the remaining parts connected into a whole by bolts. ore will be mined by both underground and open pit mining methods. It will crush and mill ore in sea water. The dissolved metals will be recovered at high efficiency from the wash solution and concentrated in four independent solvent extraction circuits, two electrowinning circuits and a fluid bed drying operation to produce high-quality copper and cobalt metal cathode and zinc sulphate monohydrate crystals. In the crushing and milling process, SBM Machinery supplies PC series hammer crusher as quaternary crusher in the circuit. 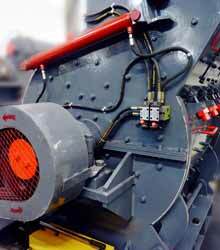 Our crushing machine can crush the run-of-mine ores into 3mm in diameter with low return rate. 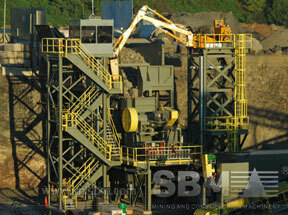 In the project, SBM Machinery offers the PC hammer crusher for the contractor. The PC series hammer crusher can be used not only in the crushing and sand making production lines, but also the mineral processing production line, taking the place of cone crushers in tertiary or quaternary crushing process.